A survival kit every outdoors man or adventurer needs in a compact, convenient size. This kit offers multiple tools that can be easily carried in a pocket, pack or glove box, making it easy to have your survival tools at hand any time they are needed. Compass - Can be read with tool kit both open or closed. Spirit Level (aka Bubble Level). Fire Starter - Flint rod with metal striker. Uses 2 Lithium Batteries - Style CR1220 (Included). 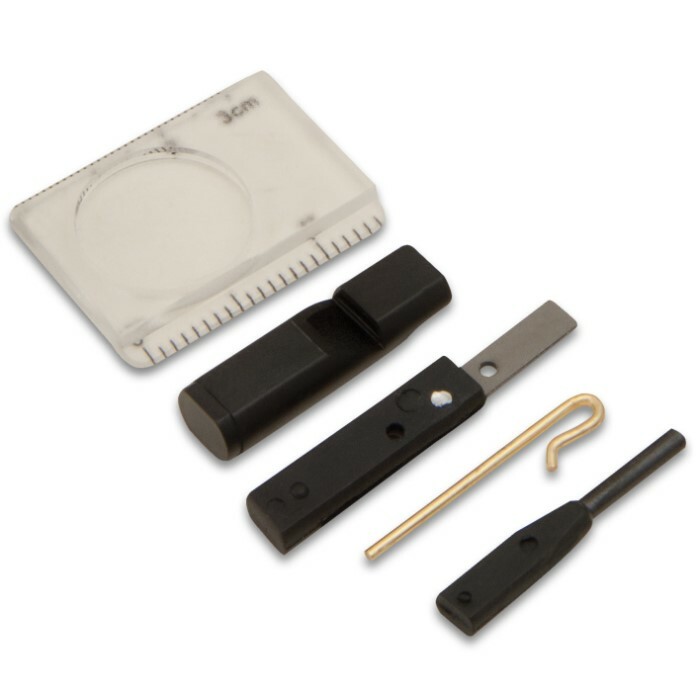 Each kit includes a brass pin stored within the hinge which is used to remove tools from the box side storage by pushing them out from the other side. Like you've certainly read 50 times, it's not supposed to be your main go-to for anything that is included. What it IS supposed to be is an awesomely inexpensive fall-back for your expensive counterparts. It all does what it should. I would go ahead and pull the mirror out if you want to use it, too small to be used while inside the kit. If your hygrometer is off, easy fix is exactly the same as any cigar humidor hygrometer, little saltwater and some hours will fix that easily. Look it up. If your thermometer is 10° high...well you now know that, and can remember every time you look at it that it's on the high side - about 10° I'd say ;-p lol, problems really aren't problems unless you are not willing to accept that slight effort is sometimes required. Light is better than not having one, 100%. I really like the dynamo hand-crank flashlights BudK sells right here for a couple of dollars...they're EVERYWHERE in our house%vehicles. Good luck! 3/5 stars. 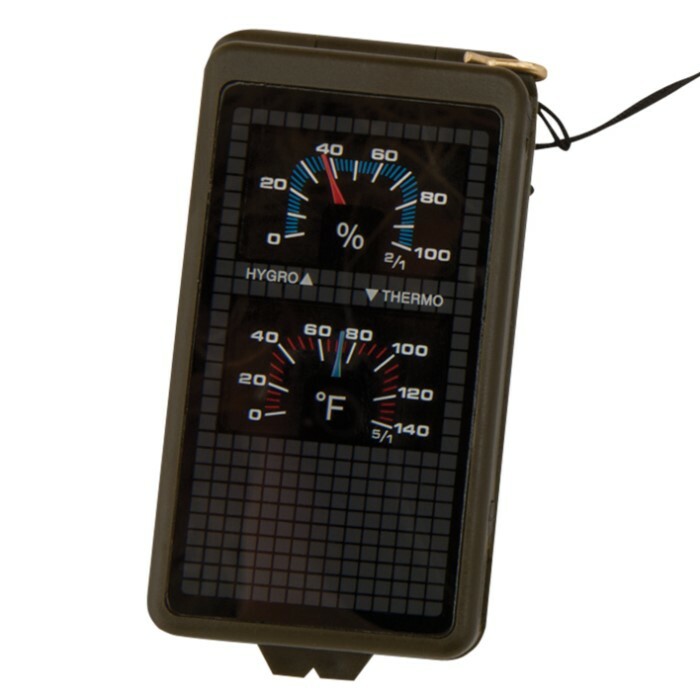 The thermometer, as previously stated is about 10 degrees high, the hygrometer is consistently 10% low and the signal mirror is glued in place so you cannot use the sighting holes to be sure you are signaling properly. Aside from a relatively weak whistle the rest works as designed. Just got this item in the mail. I was shocked by its small size, the picture in top left corner is to actual size. The item is the size of two Zippo's glued back to back. The flint needs to be scored lightly then it throws an impressive amount of sparks. The whistle doesn't do much but annoy whoever is in ten feet of you. For ten bucks I wouldn't buy it again. Would I use this as a primary? No. But as a backup device to a compass, fire starter, signaling device and light it is pretty good and worth the $10. It is compact and stuffs great in a small pocket. This little compact, light weight, gadget has ten different tools that can really help out. Monitor temperature and humidity. Use the signal mirror or whistle for signalling. A bubble level to make sure the compass is accurate. A magnifying glass and fire starter to get some heat. Have I left anything out? Probably. Can't beat it for the price. Ordered two of these. Everything worked well. Compass is on, fire starter sparks, light is enough. Needless to say, this is an emergency tool, not a pocket bug out bag. Wish it floated, as I lost one when my canoe flipped! If I could retrieve it, I bet the hygrometer is pegged out 100% Maybe I'll pack the other one in a watertight bag, along with enough smart pills to keep my boat afloat! I got this for a survival/camping kit. I was a little disappointed. Like my headline says, its works and that's about it. Its not impressive, its not that durable, the parts are tiny and could be easily lost.....that said, it does do what it says it will do.....don't recommend for a primary, but it makes a good back up. I think this is misnamed. poor all in 1 survival tool, items 2 small, but great orienteering aid. 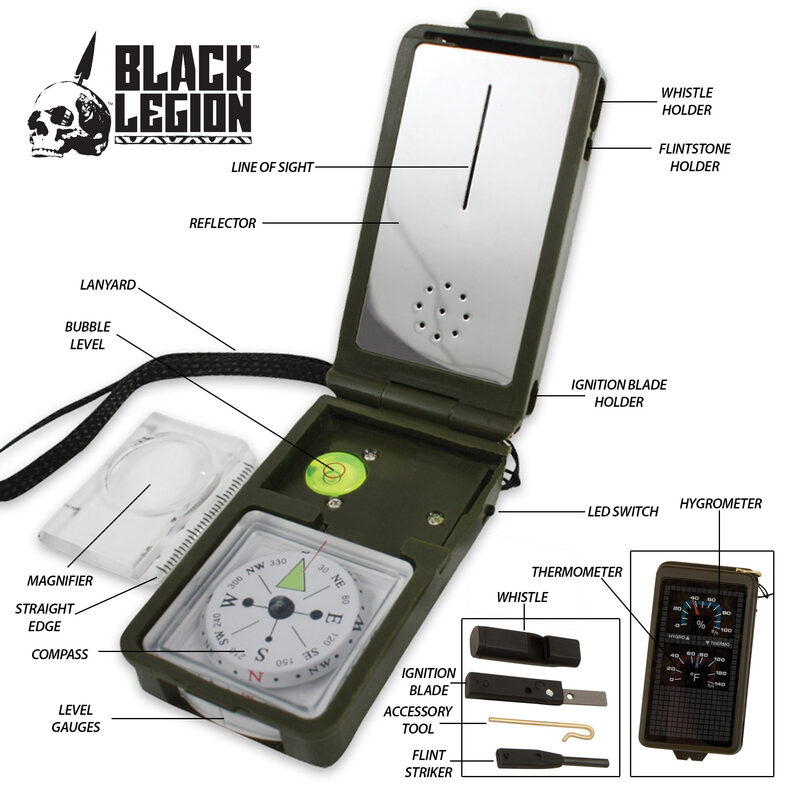 good asset for land navigation, (with map) or for hunters. high temps & humidity affect all work& play so hydro/temp feature valuable. fire starter 2 small, esp w cold hands. not bad lil item, just get for proper purpose & invest in cheap steel wool & magnesium fire starter.